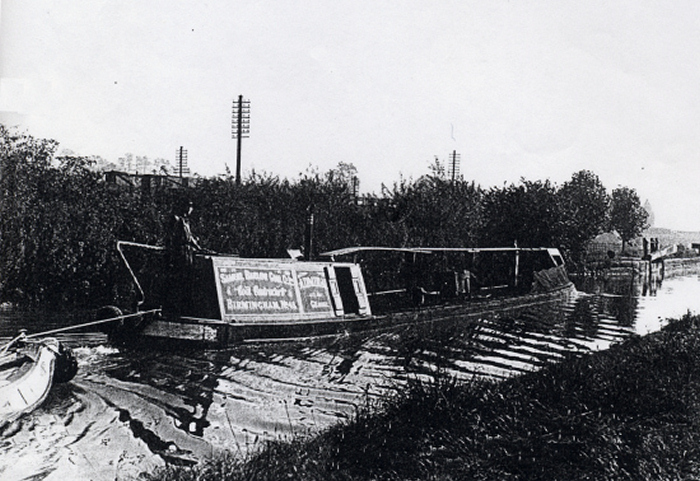 ADMIRAL in Barlow livery, towing well laden butty Rosie Agnes, entering Lock 51 at Northchurch on 10th October, 1948 with Capt. S Gibbons. deSalis' notebook: "Quick journey. MB ADMIRAL T.Green Steerer. BB UPTON. left Nottingham Thurs Nov 23 1927 Empty arr Stewarts & Lloyds Coombeswood 9pm Friday Nov 24 - 75 miles via Fradley, Fazeley, Aston, Farmers Bridge, Netherton. Dep midday Saturday 25 Nov to B'ham. Dep Sunday morning 26 Nov, arrive Brentford Wed morning 29 Nov. CW to Warwick Bar 14m. B'ham to Brentford 135m. Total 149m"
"MB ADMIRAL BB PORTUGAL Discharged ore ex London at CW Th eve 26.6.1930. Reloaded tubes Fri am 27.6.30. Passed Fazeley St 3pm 27.6 Passed Braunston 5pm 28.6Arr Brentford 8pm 30.6.1930"